Tokyo: Japan’s lower house on Friday passed a bill to ratify the Trans-Pacific Partnership free trade pact, paving the way for its enactment before the current Diet session ends in June. Following the US withdrawal, Japan and the other 10 countries hope to see the pact, renamed the Comprehensive and Progressive Agreement for Trans-Pacific Partnership, take effect by the end of the year. The agreement will enter into force 60 days after at least six countries conclude domestic procedures. Mexico has already done so. In Japan, a ratification bill is automatically enacted 30 days after it has been sent to the House of Councillors. Friday’s approval by the House of Representatives sets the stage for enactment by the June 20 end of the current regular Diet session. Japan hopes to ensure the pact comes into force at an early date as the administration of Prime Minister Shinzo Abe is promoting free trade at a time of growing concern over protectionism under US President Donald Trump. 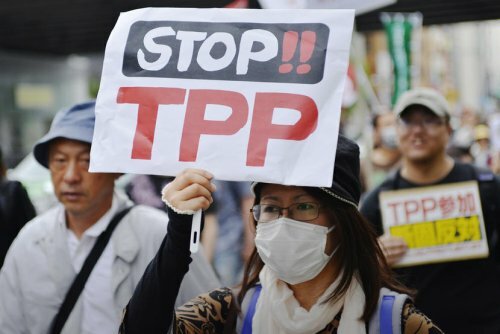 Tokyo is also seeking to encourage the United States to return to the TPP. Trump has expressed interest in rejoining the pact if the United States can get a "substantially better" agreement. The members of the TPP 11 are Australia, Brunei, Canada, Chile, Japan, Malaysia, Mexico, New Zealand, Peru, Singapore and Vietnam.